Before this study, have you ever really thought about joy being a heart matter? In our day to day life, there are so many uncertain things, uncontrollable things and scary things. Those are the kinds of conditions that we simply have no control over. The condition of our heart is completely ours to control. While this saying is completely true, the problems come in when we forget the “Y” in joy. As ladies, we are typically so busy being wonder woman wife, caring daughter, fearless mom, awesome employee, awesome employer, leader, blogger, and a whole host of other things that we forget to take some time out for ourselves. As a child of the King, doing the things listed above doesn’t give us the right to trample all over God’s amazing grace and live a life that will kill our relationship with God, but on the other hand, never obeying the Word of the Lord will also kill our relationship with God. Choosing joy isn’t always easy, but that is where our faith grows. All of us at some point will experience great sorrow, but IN that great sorrow is an Almighty God that will never leave us alone. Doing the things Kay reminds us of will get our minds and hearts in the right direction. Take time daily to do something for yourself that will warm your heart and bring a smile to your face. We forget that WE are loved unconditionally by our heavenly Father even though He knows the worst in us. 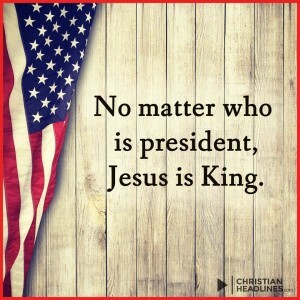 He chooses to love us in spite of our short comings. Yes, we want to get better, yes we want to reflect HIS love and compassion and yes, we want to ultimately live like Jesus. As long as we remain in our human body, we will fall short. Extend yourself some grace while trusting the Lord. When you fall short, stumble or even freak out over various situations – ask God to forgive you, forgive yourself and then take the next step. Doing this for yourself will allow you even more freedom to nurture joy in others. When we have been hurt by others, beat down or even unappreciated, many find it difficult to extend their heart to spread joy to others. It’s painful. Sometimes believing the best about others will turn out that we were completely wrong in our beliefs. They control what we see, they show us only what they want us to see, and then the truth comes out (it always does) and we are hurt because we are taken advantage of. Don’t let this stop you from making a difference in the heart and life of others. We need to push past our hurts, our fears and the things that hold us back from making a difference for others. We will disappoint others as well as be disappointed. We also need to push past our guilt when trying to make a difference for others’. Many of us desire to do more or value what we do for others based on the “cost/price” we had to pay. At Spreading Joy, I’m always reminding people that everything you do impacts hearts. Everything! When you are making a difference for others, train your heart not to look at the price tag. Look at the smile of those you are spreading joy to! Use them freely. There is a free pdf at the end of that article as well as a link to an additional 50 ways to make a difference without spending any money. Have fun spreading joy to others! 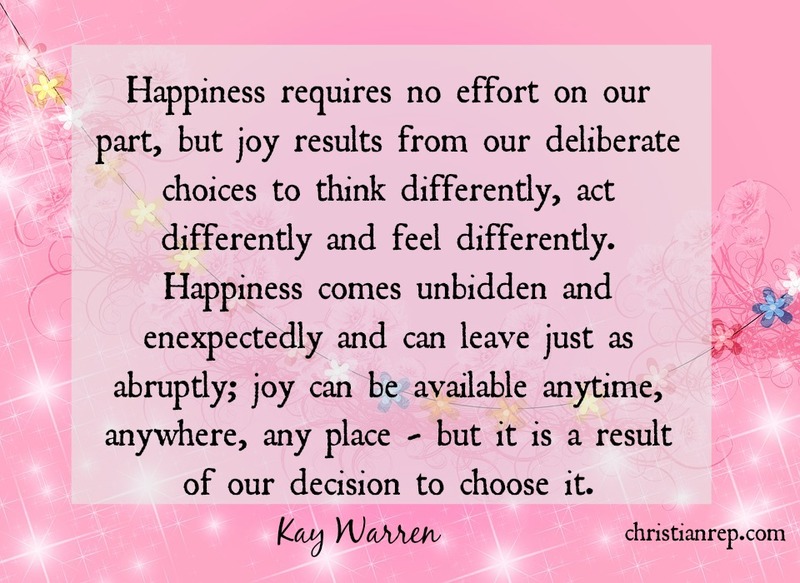 What an exciting introduction to Choosing Joy by Kay Warren! Have you ever taken time to ponder the thought that Joy IS our inheritance? Pure joy as we walk the streets of gold, as we live in mansions prepared for us, as we finally see our Savior face to face? That inheritance is waiting for us AND if the Lord did nothing more for us while we were here on earth, that would still be reason enough to choose joy in our daily lives! Aren’t you glad that God doesn’t stop with the joy of heaven? The mercy and grace that He gives to us each day is simply amazing. I love the authentic honesty that Kay Warren starts out this study with. 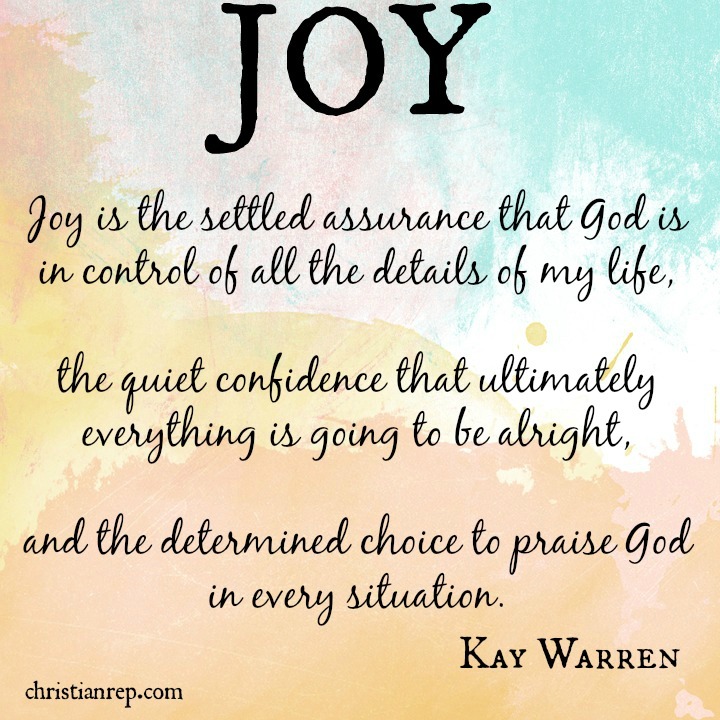 I love the fact that she lays it all out for us saying that Joy is a choice and that yes, even though we are Christians, we still struggle to find joy in the most difficult, darkest times of our lives. We tend to forget about the verses that tell us to “Count it all JOY” when we face trouble, like James 1:2 reminds us to do. Also John 16:33 tells us that we WILL have tribulation in this world, but it doesn’t end there, it also reminds us that Jesus has overcome this world. When we are struggling to see joy in our trials and we fail to, it brings about guilt, depression and makes us wonder within our heart “why bother.” That guilt weighs us down and wears us out to exhaustion and then we are no longer effective for the Kingdom of the Lord. If we are doing nothing but drowning in guilt and depression, then the enemy has won that battle. Keeping in mind what Kay says “Joy and sorrow will always be linked” we can truly step back from our trials and remember Romans 8:28 “ALL things work together for good” even if we can’t see it right now, or if it’s been many years, we can always trust God to work it out for our good. A Woman of JOY through our Attitude – We can’t change what happens, but we can control how we react to various situations. A Woman of Joy through our Words – Words are lasting! Good or bad, your words will linger in someone’s heart! 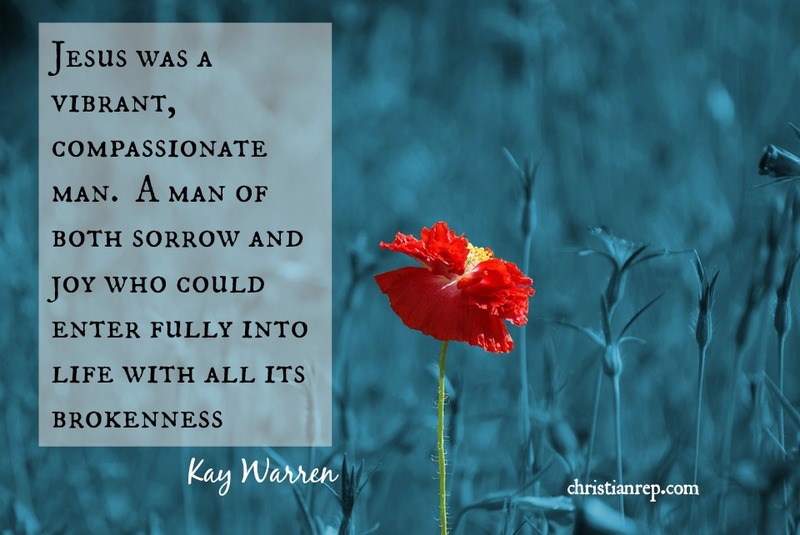 A Woman of Joy through our Actions – Jesus was a servant! As you are making a difference for others, your heart will be flooded with great joy! 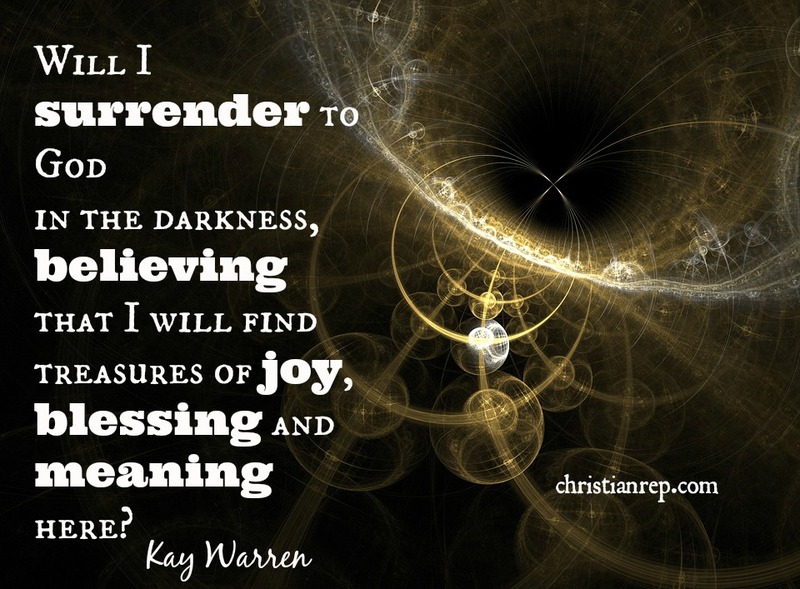 As you go through your week, seeking to choose joy, remember Kay’s definition of joy. What have you allowed to hold you back from living a life of joy? Before I answer this, I want to remind you that pain is pain…regardless of what kind – it ALL hurts. Many feel that there are big hurts, little hurts and everything in between, but, keep in mind pain hurts. Even though I’m a pretty joyful, roll with it kind of gal, I struggle with seeing the good in the negative just like many others do. The worst time was when my father died. I knew it was coming, the doctors told us he had 6 months due to a worn out heart. I tried to prepare others, get cousins, family and friends to come and see him and say what they wanted to say. I moved in with him to help him with various physical limitations he had towards the end. I thought I was ready. For nearly 2 years afterwards, I was such a deep depression that I hardly remember any of it. There was no scrapbooking, no journaling, no nothing. I went to work or church and came home to sleep. That was it. It wasn’t until I started pouring myself into others that needed help, senior ladies in my church that wanted to be a “secret sister” but couldn’t afford to. I asked people to donate things they could use and started praying more, covering the pain and guilt of not being able to “fix him.” I knew that I had done all I could for my dad, but the loss was so great that it stole my joy for a long time. He would not be happy with that as he was a “giver.” We never had a lot growing up, but we always gave to others and helped where we could. Do one thing a day for someone else. 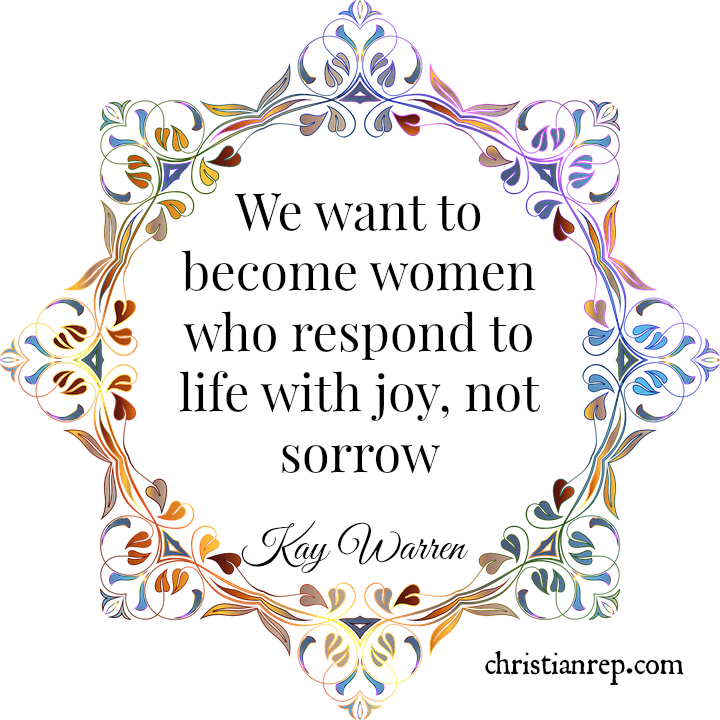 This will take your eyes off of your pain and troubles for just a little bit and allow you to see the needs of others. Also, do something you enjoy daily. These things do not have to require money, but the decision and determination to do them. The lack of “Things” will try to steal your joy, people and their attitudes will try to steal your joy, and circumstances that are beyond your control will try to steal your joy – but remember…you have a choice. 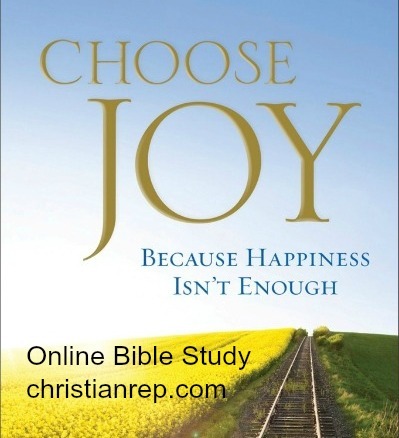 You can choose joy. It’s ok to choose joy in the middle of pain and sorrow. It’s ok to let go of the guilt and give yourself permission to be happy. It’s ok to say, “I don’t understand, but I believe God has me” and simply trust HIM. Look to your inheritance, don’t focus on the fear or sorrows that surround you, focus on the Father! What do you allow to hold you back from living a life of joy? What does your faith-life reveal about the depth of your relationship with God? 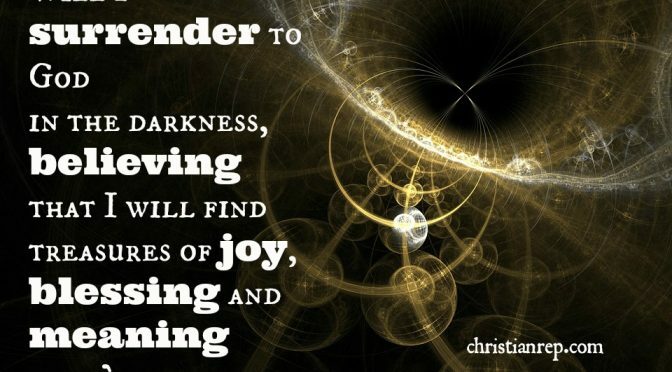 How does it make you feel to understand that God dances over you with joy? Is that easy for you to believe? Why or why not?